Growing in coniferous marsh lands of Florida and Louisiana, parts of Alabama and Mississippi, this is the most unique of all the North American natives. The erect, narrow-petal, upward facing flowers of Lilium catesbaei are red blending to yellow at the base. A difficult subject, if seed can be obtained, it is best to grow it in pots containing a constantly wet mixture of sand and peat moss or better yet, building an artificial bog specifically for this lily. Good results come from using pots that sit in a shallow pan of water. 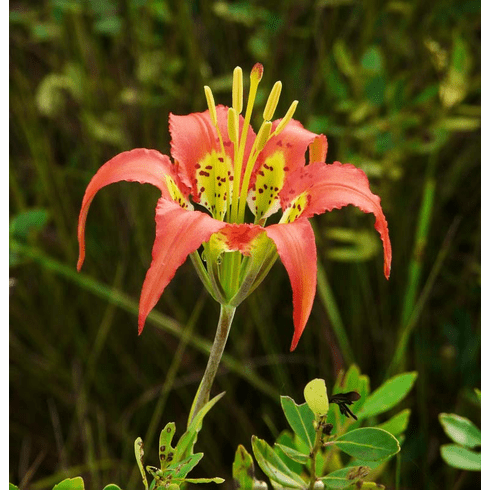 For those foolish enough to track this lily in the wild, carry your snake bite kit. Water moccasins do not take kindly to their habitat being invaded and are very protective of "their" lilies. Our title photo was taken by Simon J. Tonge in October of 2013 in the Three Lakes Wildlife Management Area in Florida. Copyright Simon J. Tonge. This image has a Creative Commons Attribution 3.0 (CC BY 3.0) license. Photo insert #1 of L. catesbaei as found in the wild courtesy of Dr. Richard M. Adams. Photo inset #2 shows detail of flower center. Copyright Denis Barthel. Courtesy WikiMedia Commons. This file is licensed under the Creative Commons Attribution-Share Alike 3.0 Unported license.